JTable Cell Edit for validation: How to assign two Different JTextField in two different JTable Column Cells. This post is also related to JTable cell validation, suppose our JTable has 3 columns. First column will take String or character type input and the second column or Column 2 will take integer type input from users. 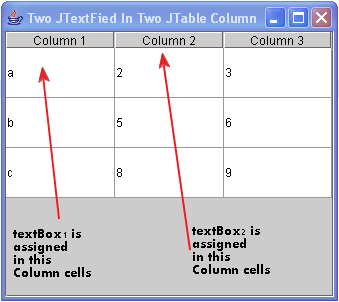 So, if we want to implement this scenario in our software we can solve it by assigning or using two different JTextField for the cells of Column 1 and Column 2 in JTable. In our example we used textBox1 (JTextField) in Column 1, which will validate string or char type input from users and for Column 2 I have assigned textBox (JTextField) to validate int type input from the users. 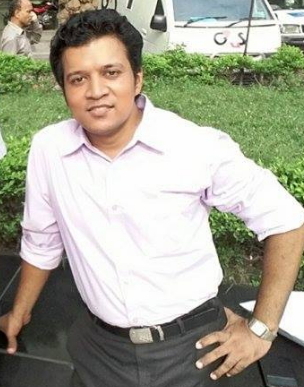 The given solution is just a basic you can implement it as your own way. Just Copy the following code and run it. Next postRecruitment Exam Preparation:English Literature|| Famous Novel, Short Story,Play and their Writers.